Screenshot of Citizen Ex. James Bridle. Some rights reserved.On November 2 the Berliner Gazette‘s Friendly Fire conference asks: are digital non-/citizens the status quo? Two prolific speakers will look for answers: the artist James Bridle, whose visionary project "Citizen Ex" reflects digital citizenship and the political thinker Eleanor Saitta, whose work explores the potential of radical democracy and consistently challenges the blind spots of the digital avantgardes. Opening the three-day conference, this public talk will reflect the politics of citizenship with regard to the rampant digitalization of people's lives – be they citizens or not. Here, James Bridle reflects on algorithmic citizenship and digital statelessness. Historically, and for those lucky enough to be born under the aegis of stable governments and national regimes, there have been two ways in which citizenship is acquired at birth. Jus soli – the right of soil – confers citizenship upon those born within the territory of a state regardless of their parentage. This right is common in the Americas, but less so elsewhere (and, since 2004, is to be found nowhere in Europe). More frequently, Jus sanguinis – the right of blood – determines a person’s citizenship based on the rights held by their parents. One might be denied citizenship in the place of one’s birth, but obtain it elsewhere. Citizenship law is strange and complex, with rafts of exceptions and omissions, which undercut the commonly-accepted view of citizenship in the Global North as something stable and absolute. In the United Kingdom, citizenship has only been defined in law since the early twentieth century, and the history of its definition is primarily one of exclusion and revocation, as the British state sought first to strengthen its borders, then to exclude its former subjects from the mainland, and finally to renounce those of its citizens who are deemed to have acted in such outrageous fashion that they should be denied due process of law. As Hannah Arendt famously wrote, citizenship is “the right to have rights”: the guarantee from which all other protections flow; and so citizenship law and how it is applied are worth watching, as litmus tests for wider democratic freedoms. Citizenship law and how it is applied are worth watching, as litmus tests for wider democratic freedoms. One of the places we see traditional notions of the nation state and its methods of organisation and control – particularly the assignation of citizenship – coming under greatest stress is online, in the apparently borderless expanses of the internet, where information and data flow almost without restriction across the boundaries between states. And as our rights and protections are increasingly assigned not to our corporeal bodies but to our digital selves – the accumulations of information which stand as proxies for us in our relationships to states, banks, and corporations – so new forms of citizenship arise at these transnational digital junctions. Jus algoritmi is a term coined by John Cheney-Lippold to describe a new form of citizenship which is produced by the surveillance state, whose primary mode of operation, like other state forms before it, is control through identification and categorisation. Jus algoritmi – the right of the algorithm – refers to the increasing use of software to make judgements about an individual’s citizenship status, and thus to decide what rights they have, and what operations upon their person are permitted. The origins of this form of citizenship lie with the United States’ National Security Agency (NSA), although it seems unlikely that they are the only state or other surveillant body to deploy such tests. Among the documents leaked by Edward Snowden in 2013 is to be found a file entitled “Procedures used by the National Security Agency for targeting Non-United States Persons reasonably believed to be located outside the United States”. These procedures are necessary because, under US law, NSA is not supposed to surveil US citizens, or those who are located within the US. Such a division was relatively simple in the days of physical eavesdropping: black chambers for opening the nation’s post; secure rooms in exchanges for tapping telephone calls. But in an age when most of the world’s internet traffic passes through the United States, ascertaining who exactly is under surveillance is more difficult. In response, the NSA’s procedures use a points-based system to determine, on a case-by-case, byte-by-byte basis, whether a target is eligible for surveillance, based on the texture of their communications. From this determination flow all of their rights: this determination determines citizenship. 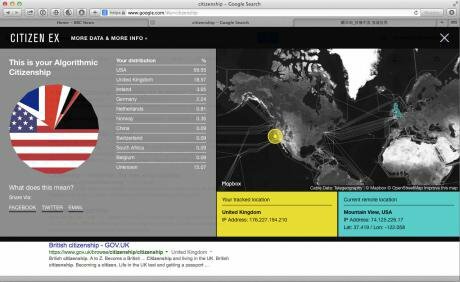 In 2015, I created Citizen Ex, a free-to-download browser extension which tracks your movements online (and does so entirely privately; I do not have access to any of the data thus generated). Every website you visit is recorded, as well as its location. Over time a map builds up, populated with the places your data has been and gone to: datacenters and servers in other places, other nations, and other legal jurisdictions. And each of these locations is weighted and judged, contributing to a percentage score of the nations you visit virtually: your algorithmic citizenship. At time of writing, my own Algorithmic Citizenship is 74.68% USA, 4.5% United Kingdom, 1.45% Germany, 1.42% Netherlands, 1.22% Ireland (home to a large number of European datacentres), and a host of lesser attributions. Of course, NSA’s determinations are far more sophisticated than these, but it’s interesting and useful to get a sense of one’s own distribution. Some users have reported attempting to “browse more locally”, while others have learned much about the physical infrastructure of the internet, an important new form of literacy in a time when this infrastructure both illuminates and reproduces the political and juridical structure of the world. Every link clicked, every site visited, every HTTP call made and header sent, subtly recalibrates the balance of our rights. Using Citizen Ex over time, the key characteristic of algorithmic citizenship becomes clear. Every link clicked, every site visited, every HTTP call made and header sent, subtly recalibrates the balance of our rights, as percentages shift and different judgements are made. Algorithmic citizenship is significant not because it is new, or because it is distributed, or even because it is, most of the time, opaque to the subject, but because it is constantly in flux. Moment by moment, the citizenship assigned to us, and thus the rights we may claim and the laws we are subject to, are changing, subject to interrogation and processing. We have become effectively stateless, as the concrete rights we have been accustomed to flicker and shift with a moment’s (in)attention. We live in a time of both mass migrations, caused by war, climate change, economic need and demographic shift, and of a shift in mass identification, as ever greater numbers of us form social bonds with other individuals and groups outside our physical locations and historical cultures. If we accept that both of these kinds of change are, if not caused by, at least widely facilitated by modern communication technologies – from social media to banking networks and military automation – then it follows that these technologies may also be deployed to produce new forms of interaction and subjectivity which better model the actual state of the world – and one which is more desirable to inhabit. An interesting current experiment in digitally-mediated citizenship is to be found in Estonia, which since the mid-1990s has prided itself on being the most wired country on Earth, investing heavily in internet infrastructure, IT skills, and digital society innovations such as online voting, direct democracy, and electronic health records. In 2014, Estonia started offering an “e-residency” programme, which offers the benefits of Estonia’s digital society to almost everybody: the ability to open a bank account, digitally sign documents, start a business, pay taxes online – in short, many of the government services available to its own citizens, with the exception of actual, physical residency. In effect, Estonia has delaminated a raft of state actions from the substrate of its physical territory, offering citizenship-as-a-service on the model of contemporary cloud software platforms. Ironically, Estonia has one of the largest stateless populations in Europe. In common with its Baltic neighbours, a significant proportion of the population is effectively stateless due to naturalisation laws passed after the fall of the Soviet Union. These laws required members of ethnic groups from Russia or elsewhere in the Soviet Union to reapply for their citizenship of the newly independent republics. For reasons of politics, bureaucracy, history, family, or any number of other causes, many failed to apply or pass, resulting in thousands of “non-citizens” who are still today subject to restricted democratic rights, limits on movement, and multiple forms of discrimination. It remains to be seen whether technological innovations such as e-residency will benefit those with most to gain from reengineered systems of citizenship, or, like so many other digital products, merely augment the agency of those who already have first-class passports, first-class access to information, and the first-class opportunities which flow from these privileges. It remains to be seen whether e-residency will benefit those with most to gain from reengineered citizenship, or, like so many other digital products, merely augment the agency of those who already have first-class rights. As the example of NSA’s procedures for determining citizenship illustrate, contemporary networked interventions in the sphere of identity are typically top-down, state-led, authoritarian moves to control and discipline individual subjects. Their operational processes are opaque, and they are used against their subjects, reducing their agency. The same is true for most corporate systems, from Facebook to Google to smart gas and water meters and vehicle trackers, which abstract data from the subject for financial gain. The Estonian example shows that digital citizenship regimes can point towards post-national, post-geographic territories, while continuing to reproduce the forms of identity most conducive to contemporary capitalism and nationhood. The challenge is to transform the internet, and thus the world, from a place where identity is constantly surveilled, judged, and operationalised, to a place where we can act freely as citizens of a greater sphere of social relationships: from a space which is entirely a border zone to one which is truly borderless. Such a change requires a radical re-engineering of most of the systems we use today, which are inherently constructed as anti-privacy, data-gathering, judgement-processing and capital-accumulating networks. But the seeds for doing so are present within the technologies as well: systems of distribution, of anonymity and encryption, of proof and assertion. If we could truly own our data selves, and decide for ourselves what information to give out, and which to hoard, which to share and which to delete forever, then we would have the tools at our disposal for a more equitable negotiation with commercial and governmental forms of power. The ability to accumulate, store, and process such valuable information has historically been the prerogative of the state, and increasingly of the corporation, but as we migrate from place to space, moving between the physical to the digital, the possibility of determining and asserting our own citizenships, our own rights, becomes more and more widely available to us.